In this post, you will learn the best practices on digital audio editing. This is written for beginners in digital music. The practices outlined in this tutorial can be applied to any audio editing software either in Windows, Mac OS X or Linux. The practices below are also applicable in professional music production environment. A common beginner mistake is using a lossy file type such as MP3 when editing audio files. While this is possible, this is not the best practice because MP3 file is already a compressed version. Compressed version does not contain complete information of the audio that you are going to manipulate in the audio editing process. The best practice is to use the highest audio resolution as the source audio file for editing. This is usually the uncompressed audio file format such as .wav or .aiff file. 1.) When you are converting a WAV file to MP3. You will get better sounding results if you are converting from an uncompressed file type such as WAV. An even much better quality if you are converting from 24-bits WAV file than the 16-bit audio version (also known as the CD audio version). If you do not have the 24-bit WAV file version, you can still use the 16-bit version and still works out fine for most cases. This practice is definitely helpful if you are distributing MP3 files. Supposing you both have a 16-bit WAV and 128kbps MP3 version of the song; you should not use the 128kbps MP3 version to create a 320kbps MP3. The best practice is to always use the highest resolution available and that is the 16-bit WAV version. This method would produce better sounding MP3 audio files. 2.) 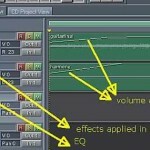 This rule is not only helpful in creating MP3’s but editing audio waveforms as well. Supposing you would want to edit the waveform of Song X; you should be using the uncompressed version (16-bit WAV file will do but 24-bit WAV version is highly recommended). 3.) If you really don’t have any original WAV version of your song; you can use the MP3 version and import it to your software. Take note that your software can’t natively process MP3 files with effects or plug-in; so the software will convert that to an uncompressed format (.wav). Bear in mind this conversion process won’t restore the quality lost in the original MP3 conversion. It is simply a method that allows you to edit compressed audio files in your software. The table recommends that you should not be saving the edited file to a lossly/compressed format. For example if you are editing 24-bits WAV file, you should also be saving it as 24-bits WAV. Or if you are editing MP3 file because you don’t have any high resolution version, then save it either as 16-bits or 24-bits (recommended) WAV file after editing. This will preserve the quality after editing. LAME for MP3 is an open source/free software. In addition, when it says “sample rate should be the same with the source audio”; implies that you should not be converting the sample rate when saving the editing file. For example if the source audio is 16-bits/44.1kHz WAV. 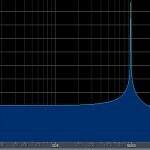 The sample rate in this case is 44.1 KHz. After saving the file, the sample rate should still be the same. This practice preserves the original quality of your source audio as sample rate conversion can introduce audible artifacts after processing.